The 16" x 16" 300gsm microfiber towels have been our #1 selling product for over 10 years! It is the perfect combination of weight, size, absorbency, cleaning ability and price. 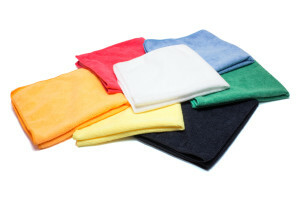 We suggest that you order these ultra microfiber towels in bulk in various colors and assign them to different tasks. For example, blue for dusting, green microfiber hand towels for bathrooms, yellow for kitchens, white for glass. You can fold these all purpose microfiber cloths in 4 (like the photos above) to create eight fresh cleaning surfaces. When one side is dirty, just rotate to a new clean surface and wipe away! With these microfiber cleaning towels in bulk, you can dust your home, detail your car, clean a hospital room, pick up spills, mop your floor, dry your dishes, clean your golf clubs, dry your face, wash your body, wipe your dogs feet, dry your wet cat, clean your windows, wipe smudges from your TV and computer screens, wipe down your guitar, and wipe off your sweat. These all-purpose towels are not color fast, so make sure that you wash darker colors separate from lighter colors.